Trunkster Suitcase Is Packed With Modern Digital Convenience | OhGizmo! 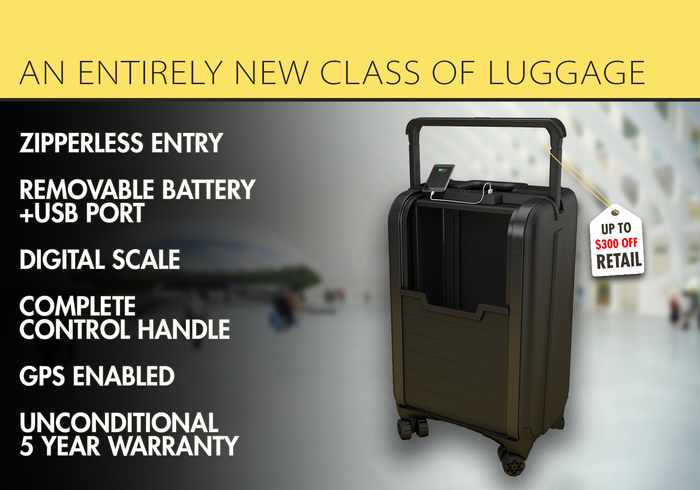 Major luggage manufacturers are going to start playing catch-up soon if things like the Bluesmart suitcase takes off. Now there’s another entrant in this increasingly crowded field, and it’s called Trunkster. This one doesn’t have any zippers, opting instead for an easy-open sliding door. On the tech side, there’s a built-in scale as well as a 3 Amp, 15,000 mAh battery pack to charge your devices. A $40 option even gives you GPS tracking abilities, in case your suitcase ends up with Nermal in Abu Dhabi. An Aluminum and polycarbonate build ensures your stuff doesn’t get crushed in the cargo hold, and a hidden compartment keeps important documents in a slightly safer spot. It’s a $295 pledge for the carry-on, or a $335 one for a checked Trunkster.